If you haven’t heard about #CharityShakeOff, you must be living under a rock. Or been away for a week without access to the internet…either way, you’ve been missing out! It all started off with a tweet from Macmillan’s CEO Ciaran Devane who said that the Shipley fundraising team had been challenged to do the Harlem Shake for a donation. A few days later I spotted a tweet from the RNLI with their Harlem Shake and thus, #CharityShakeOff was born! Mencap then also came on board (no RNLI pun intended) and, well, you can read more about it here. So after a week of votes- votes were by text donation and were decided by number of donations rather than amount- I am delighted to reveal the #CharityShakeOff champion is….drum roll please…. Raise awareness. My Storify has had almost 2,200 views and the post on UK Fundraising has had over 2,500. It even went global! Influential people in the charity world have been blogging about it, such as Kevin Baughen, Zoe Amar and it was featured on Charity Digital News. There has been an increase in the views of their Harlem Shakes on YouTube and I have been watching their Twitter followers going up quite significantly over the week. 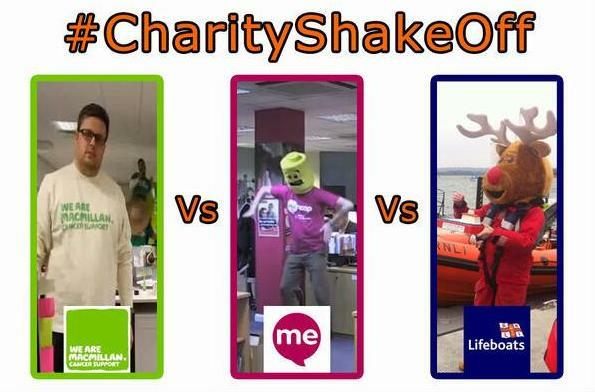 They say that imitation is the sincerest form of flattery and the #CharityShakeOff saw other charities, notably BBC Children in Need, WWF and Leukaemia & Lymphoma Research get their shake on. What has been wonderful is the sheer number of tweets and Facebook posts from dedicated staff and supporters (and even a few celebrities – including Ben Ainslie, Alastair Campbell and Oliver Phelps) urging people to vote for their charity. I was at a CharityComms seminar last week where Emma Harrison, Director of External Relations at Mencap, was talking about their aim to have 1 million supporters over the next five years. I sincerely hope the #CharityShakeOff has helped them somewhat in achieving that aim. Top post Kirsty, and it was an amazing campaign. Great work from Macmillan Cancer Support, RNLI and Mencap – Serious issues are serious, but you can raise awareness and cash for them by employing a sense of humor. I’m really impressed with the way you pulled it together. Kudos as well to Amy Burton, Chris Payne, Anil Arora, Carol Naylor, Becky, Luke Williams, and any other bods behind the efforts of the three charities. Great work laying down the challenge Kirsty. Here’s to the next one! Great initiative and great post Kirsty. Interesting to see average donation value for each charity… I wonder what it says about RNLI v Macmillan with £2.31 v £1.69 average value? Or is this an anomaly in the numbers? Well, I think Macmillan was promoting just a £1 donation whereas RNLI was saying Text £(amount) to …. What is really great though is I’ve seen that both are still getting donations in today!